Sydey Hotels and Accommodation ideal for the Business Traveler. Whether you are lokking for the ideal location close to Business, a Central CBD Hotel, somewhere to entertain your clients, and All-Suites Property or just somewhere convenient and reasonably priced. A wide range of Sydney Hotels for the Businessperson on the move. All rates in AUD and Secure Australian based Reservations System. Superbly located in Sydney's CBD, only 5 min to Darling Harbour, Cockle Bay, major retail stores, the Entertainment Centre, China Town & numerous restaurants, this 27 storey building has commanding views of Darling Harbour & the City from most of its luxuriously appointed apartments. Metro Hotel Sydney provides ultimate in comfort and convenience. Located in the CBD location, the Metro Hotel Sydney is a quiet, secure haven for business and leisure travellers alike. With its historic facade, the Metro offers such a combination of character, convenience, quality and genuine value for money accommodation. Medina Classic Martin Place is ideally located in the heart of Sydney's vibrant CBD and shopping precinct, only one block north of Martin Place (off Castlereagh Street). This exclusive location allows you to experience live theatre, cinemas, Sydney's major attractions, and a variety of restaurants and cafes. There are 49 studio and one bedroom apartments, all with fully equipped kitchens and laundries. All Seasons Premier Menzies Hotel Sydney offers warm hospitality and the traditional friendly service of yesteryear with modern comfort and style. This 446 room, four star hotel, overlooks Wynyard Park and is conveniently located in the heart of the CBD in close proximity to Sydney's famous attractions and the financial district. The hotel offers spacious guest rooms, superb recreational facilities, excellent conference rooms and is renowned for its choice of restaurants and bars. The Grace Hotel is Sydney's elegantly restored, heritage-listed art deco hotel right in the heart of the CBD.Designed with the traveller in mind, it features a state-of-the art business centre and in-room technology, a fully-equipped rooftop fitness centre, spa, sauna, steam room and lap pool. Hotel is just a few minutes walk from Sydney's beautiful and bustling Harbour, the Opera House, luxury shopping precincts, and the major conference and exhibition centres of Darling Harbour. 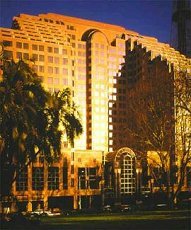 Rydges Jamison Hotel is located in the heart of Sydney's central business and shopping district. Nestled between bustling George and York Streets opposite the APT centre and adjacent to Westpac Plaza, Rydges Jamison Sydney is just a short stroll from the Australian Stock Exchange and surrounded by some of Sydney's largest international corporations. Rydges Jamison Sydney is a luxurious 5-star hotel, which combines Australian culture and European style, located within walking distance to the Sydney Opera House, Harbour Bridge, historic Rocks area, Circular Quay and just a short drive from Darling Harbour, Fox Studios Australia, Bondi Beach, Manly and Star City Casino. 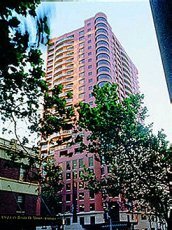 Saville 2 Bond Street is located in the heart of Sydney's CBD and prime financial district. The hotel offers 180 impressively appointed apartments including 5 penthouses, Executive Women's Floors and a Boardroom for small meetings. A luxurious rooftop pool and spa offer panoramic Sydney city views. Along with classic design and sophisticated sense of style, the unique ambience of Saville 2 Bond Street has been created through close attention to the finer details. Sir Stamford at Circular Quay is an award-winning hotel that offers a truly personal service while creating the ambience of a luxurious private club. Stamford's world-famous style blends perfectly with the exuberant, cosmopolitan character of Sydney, creating a sophisticated yet welcoming haven.It is located only 20 minutes from the airport, a moment's stroll from the world's most beautiful harbour, the Royal Botanic Gardens, the Opera House, and many other Sydney landmarks. Sir Stamford Hotel offers 105 comfortable and spacious guest rooms, each having many unique features and its own charm. We wish you a Properous and Enjoyable Business Trip to Sydney Australia. Don't forget to take the opportunity to enjoy Sydney's amazing Sights, fine Restaurants and Entertainment. Once again, have an enjoyable stay in Sydney Australia.